This concentration card game gives your memory a real workout. Note: The HTML5/Mobile version works on desktop computers, tablets, and phones. It is the same type of game but made by a different game developer. I can't emphasize enough how advanced this game is compared to the traditional "Concentration" memory game played with a deck of cards. This is a true brain game. 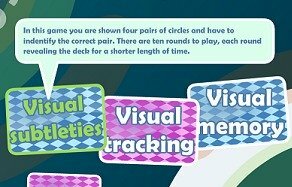 If you like this game, you might also enjoy the other free memory-improvement games on this site, such as Brain Power Zoo and Glitter Memory. HOW TO PLAY. Wait for the game to load, then click the "Play" button. After the game loads, you need to choose which mode to play. You can either play in regular scoring mode or daily practice mode. Flipped Out is based on the rules of the traditional Concentration card game. In a standard Concentration game, pairs of cards are placed face-down on a table. Your goal is to memorize where all the cards are located. Game play proceeds as you turn over cards one by one. When you can remember where two matching cards are, turn them both over and keep them face up. Each time you turn over two cards that don't match, you must place them both face-down again. Flipped Out follows similar rules, but always with a twist. In every case, you are given a quick look at the cards, during which you must quickly memorize their locations. But what happens next can be tricky. On some levels, the cards turn over very fast; other times the cards are shuffled while you are memorizing their locations. Because Flipped Out offers complex memorization tasks coupled with a time limit, it provides excellent training for both attention span and short-term memory ability. To get started with regular mode, click the "Play" button. To enter practice mode, click the "Daily Practice" button. TIP: Take advantage of the "Daily Practice" section of the game to continually improve your concentration and short-term memory. The regular mode of this concentration card game will stretch your brain cells to the limit. I found this game to be really tough. Which is what you want when trying to improve your brain, of course. The pass/fail counter along the left side of the game tracks whether you succeeded or failed each level. A red dot indicates you did not pass; a green dot indicates you did. Proceed through each memory task with utmost concentration. Don't worry if you find this concentration card game difficult. It is! In Daily Practice Mode, improve your skills in the three brain training categories described below. There are no scores in practice mode - just try and improve your skills. For best results, set goals for yourself. And at the end of each daily session, write down in a notebook how well you did in each category. Spend five or ten minutes every day training these skills. Keep up with this for at least two or three weeks before moving on to something else. I'm sure you'll notice an improvement in your concentration and memory. (1) VISUAL SUBTLETIES. You are shown four pairs of circles and have to identify the correct pair. There are ten rounds to play, each round revealing the deck for a shorter period of time. (2) VISUAL TRACKING. Four pairs of cards are revealed two at a time. Keep focused on the pair you are looking for. With each round the cards are dealt faster with less of a time gap. (3) VISUAL MEMORY. All eight cards are revealed at once and then hidden. Two cards change places, and you have to identify which ones swapped. With each round the reveal time is reduced. Concentration card games such as Flipped Out are timeless because they work. Anyone who wants to improve their concentration and short-term memory should make Flipped Out and other memory card games part of their regular brain games fare. Game distributed by FreeGamesForYourWebsite.com. Used with Permission.